It's been a while since I added a post because I had house guests and a week's vacation around Thanksgiving time. I'm trying to get back in the blog groove now, but I suspect I won't have too many posts the rest of the year with Christmas and New Year's Eve/Day on the horizon. In any event . 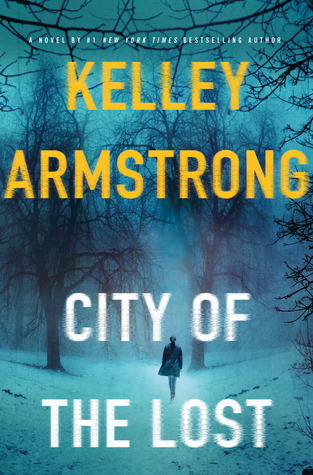 . . today I'm featuring City of the Lost by Kelley Armstrong. It's an upcoming read borrowed from the library. "I killed a man," I say to my new therapist. I've barely settled onto the couch . . . which isn't a couch at all, but a chaise lounge that looked inviting and proved horribly uncomfortable. Like therapy itself. These are really great opening lines to the first book in the Casey Duncan crime series. The narrator has made a serious statement and sought counseling before, so there's a lot for readers to learn about her. Apparently, Detective Duncan has a secret from her past that she fears will catch up with her, which should make for an interesting plot. For readers who get hooked by the fist book, the next in the series, A Darkness Absolute, will be published on February 7, 2017.